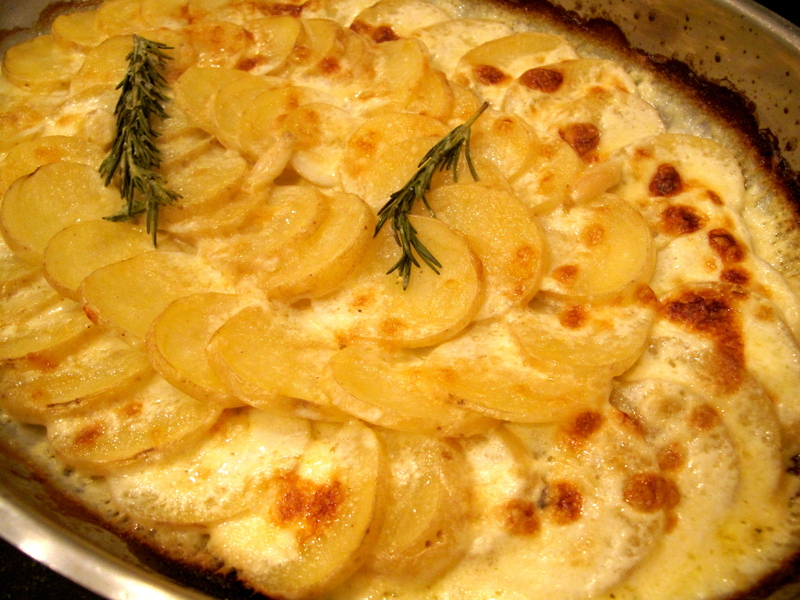 Potatoes cooked in cream, garlic and rosemary. Really, what objections could you have? For the best results make sure that the potatoes are equal in thickness so that they cook at the same rate. Serve with roast chicken or a good steak and lots of veggies. I most recently made this at a friends house for a dinner party but it is a great dish to throw together whenever you need to feed a crowd and want something fancy looking but quick. Want to get really crazy? Make individual mini-gratin’s in a muffin tin. Layer potato slices and gruyere before pouring the milk mixture over top. Peel potatoes (if desired) and slice 1/4″ thick. Use a mandolin if possible to ensure that slices are equal in thickness. Bring milk, cream, 3 cloves of garlic, and rosemary to a simmer. Remove from heat and let steep. Rub baking dish with remaining clove of garlic and butter. Arrange potato slices in dish in an overlapping pattern. All slices should fit in 1 equal layer. Pour warm milk mixture over potatoes. Top with grated gruyere and season with salt and pepper. Bake for about 25 minutes or until browned and potatoes are soft but not falling apart.